The Nvidia Quadro P4200 is a mobile high-end workstation graphics card for notebooks. It is based on the GP104 chip (like the consumer GeForce GTX 1070 or 1080 for laptops) and features 2304 shader cores. The clock rate is not disclosed but the theoretical SP performance is rated at 8.9 TFLOPs (for the fast Max-P version) and therefore faster than the old Quadro P5000 but below the Quadro P5200 (see table below). The P4200 is equipped with 8 GB GDDR5 which leads to 224 GB7s peak bandwidth due to the 256 Bit memory bus. There are two variants available, a Max-P performance version and a Max-Q version tuned for efficiency (with lower clock speeds). The Quadro GPUs offer certified drivers, which are optimized for stability and performance in professional applications (CAD, DCC, medical, prospection, and visualizing applications). The performance in these areas is therefore much better compared to corresponding consumer GPUs. The power consumption of the Quadro P4200 is rated at 115 Watt TGP (max power consumption incl. memory) and therefore 15 Watt more than the Quadro P5000. The card is therefore best suited for large 17-inch notebooks. 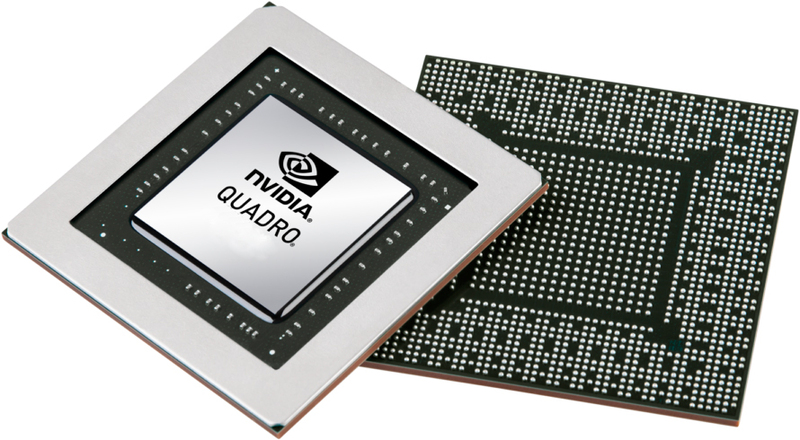 The Nvidia Quadro P1000 is a mobile entry-level workstation graphics card for notebooks. Similar to the consumer GeForce GTX 1050 (Laptop), it is based on the GP107 chip but offers only 512 shaders (1050 offers 640, 1050 Ti 768). The graphics card is designed for the Kaby Lake / Coffee Lake generation. The theoretical performance should be below the GeForce GTX 1050 due to the lower shader count. The Nvidia Quadro P3000 Max-Q (official Nvidia Quadro P3000 with Max-Q Design) is a mobile high-end workstation graphics card for notebooks. Similar to the consumer GeForce GTX 1060 (Laptop), it is based on the GP106 chip with 1280 shaders. The graphics card is the more efficient version of the normal Quadro P3000 with slightly reduced clock speeds at a much reduced power consumption (60 Watt versus 75 Watt TGP). The theoretical performance should be only slightly below the normal Quadro P3000 (as it was with the Max-Q GTX 1060 versus the normal GTX 1060). Your browser does not support the canvas element!